As I type this, my slow cooker has been on for 36 hours straight. Is that allowed? I am officially obsessed and I completely understand why you all have been too while I was under a little rock. Wow! I made this awesome sweet potato chili the other night, then washed out the insert and put in some beef bones to make beef stock while I slept. Then the next morning strained the beef stock and made a grass-fed beef brisket with veggies that I turned into a delicious sauce for pasta. I’m on fire! Are you gearing up for Super Bowl Sunday? I love football, so I am always excited for the big day. What I’d really like to know though, is why does everyone make chili for the Super Bowl? Or a lot of Tex-Mex food? I take that back. My family in NY will be eating sausage and peppers and a baked pasta of some sort. Maybe it’s just Southern California, but everyone I know is ripening their avocados for guacamole to go on top of their tacos or nachos or what have you. Just curious since I am one of these people too and I’m not quite sure how I got to be. I do try and mix it up a little every year, but somehow chili makes it onto the menu in some way. I have been alternating between Vegetable Chili (my favorite) and Deer Valley Turkey and Black Bean Chili, which I serve alongside a baked potato bar, corn bread and Mexican Chopped Salad which I have a feeling doesn’t resemble anything you’d get in Mexico but sure is the perfect salad to go along with everything else Tex-Mex-y. I’m in a bit of a conundrum this year with only two days to go until Super Bowl Sunday because I have no menu yet! There are too many things I would love to make, including this fabulous chili as well as Slow Cooker Chicken Tacos or even this terrific-looking vegetarian tortilla soup recipe I spotted on Foodily. Alas, I have a mere one slow cooker. Fear not, good people. I will share with you how to make this recipe on the stove in case you either do not have a slow cooker (yet) or you only have one slow cooker and you are planning on making my slow cooker chicken tacos. I like to have a good balance of different food groups even on Super Bowl Sunday so that it’s not just chips and animal protein all day long. Personally, I think chili is an easy dish to do vegetarian. All those beans are super high in fiber and protein so they’re really filling and it’s the spices that make everything taste delicious, not the meat. 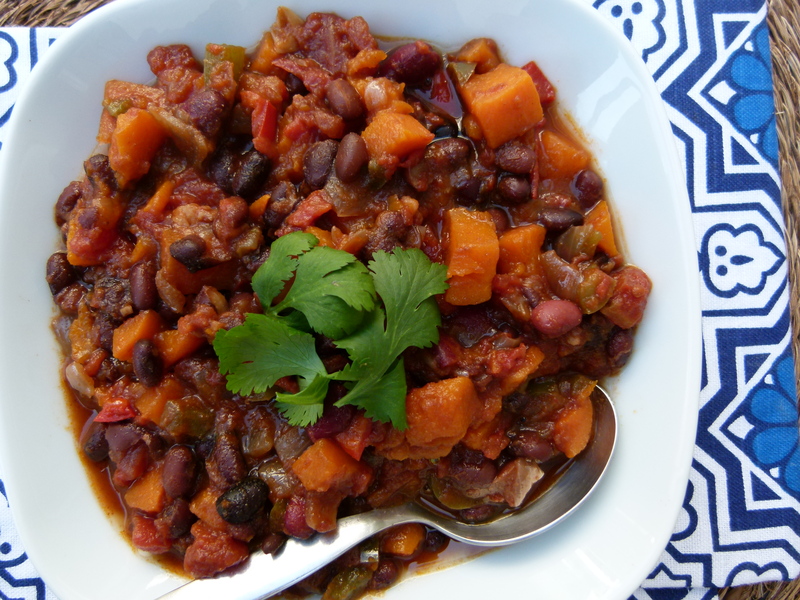 This chili is really interesting because it includes a bit of sweet potato, one of my most favorite foods. There’s a touch of cinnamon and cocoa powder which you can’t really taste, but pairs great with the chili powder. I didn’t add any leafy greens, but in retrospect I think a few chopped leaves of chard, spinach or kale would have been a nice addition at the end. This Super Bowl I’m rooting for you to eat something healthful! Omit this step if you cannot bear to pre-cook anything when using a slow cooker. I like to sauté my vegetables because I think it adds more flavor, but feel free to dump everything (omit the oil) into the slow cooker and press “start.” Otherwise, heat oil in a large skillet (if not using a slow cooker, sauté in a large pot) over medium heat. 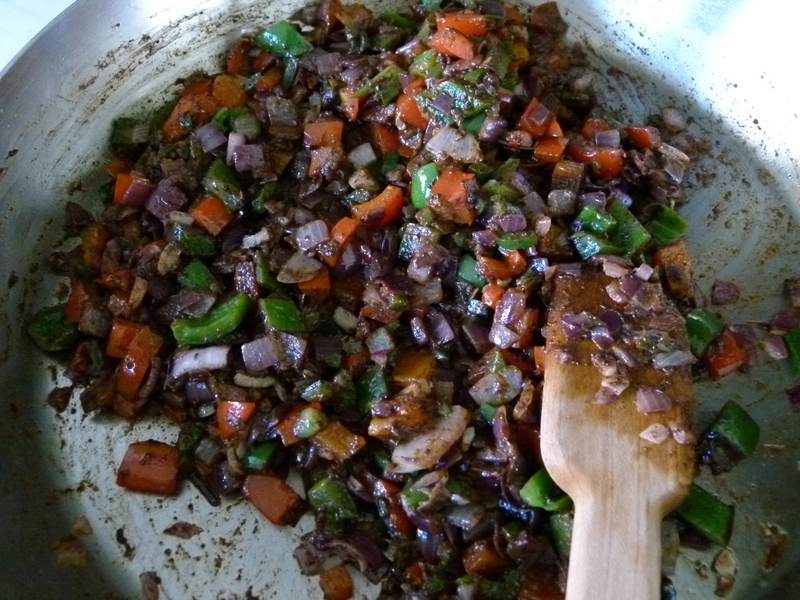 Add onion, peppers and garlic and sauté until onions are tender and translucent, about 6 minutes. Add spices, salt and pepper and stir until fragrant, about 1 minute. If your tomatoes are unsalted, use 2 teaspoons salt. 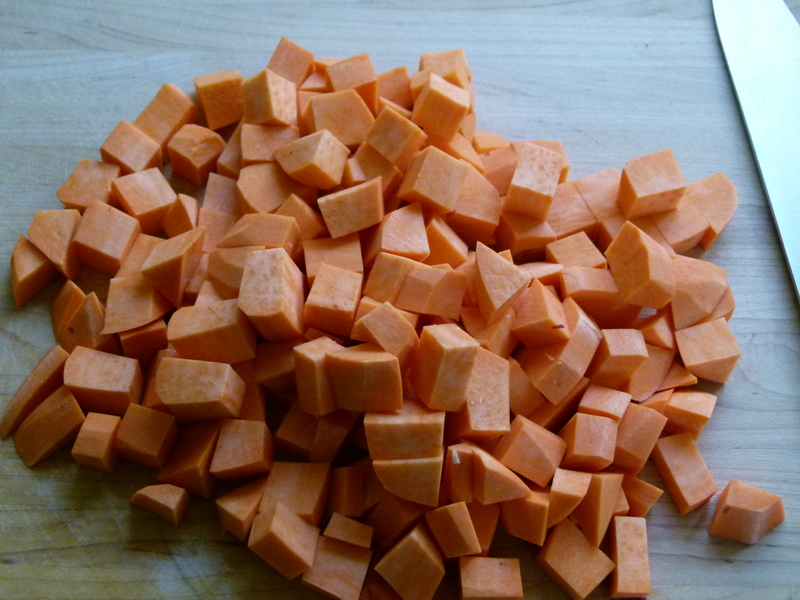 Cover and cook until sweet potatoes are tender and the chili has thickened, on low for 7-8 hours or on high for 4 to 5 hours. I have also served this with cooked quinoa and millet, which was delicious. Also, I think adding some chopped fresh leafy greens about 10 minutes before serving would be very nice, too. Swiss chard, spinach and kale would all work well. Can I double this in the slow cooker? Or if I’m doubling should I do stovetop and reheat tomorrow for Super Bowl? Ooops! Got to your comment post-Super Bowl, sorry! You can double this in the slow cooker. You can also make it the day before and reheat it on the stove or in the slow cooker and keep it on the warm setting for the day. Hi Pamela! 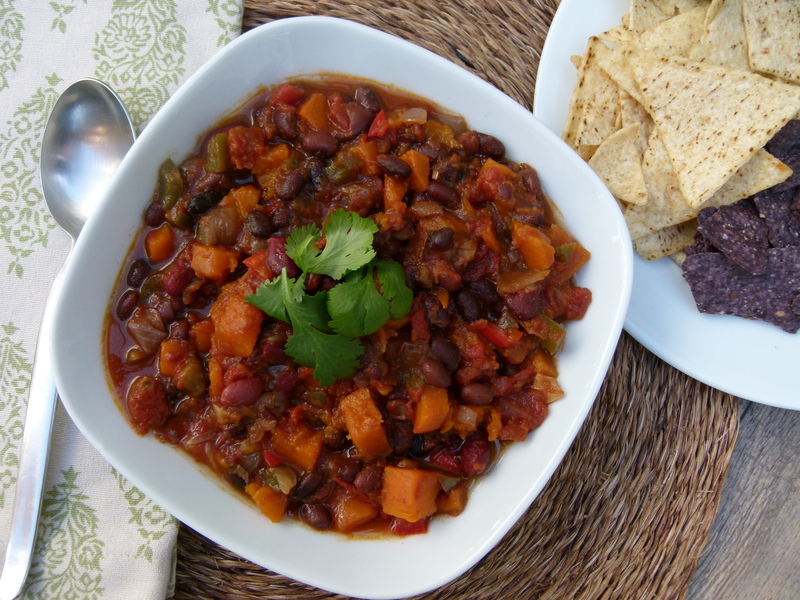 I still want to make this in the slow cooker, but would like to use dried beans. Should I still soak and pre-cook the beans before adding? Thank you! Technically you don’t have to, but soaking ahead of time does make them more digestible. Do whatever you have time for. 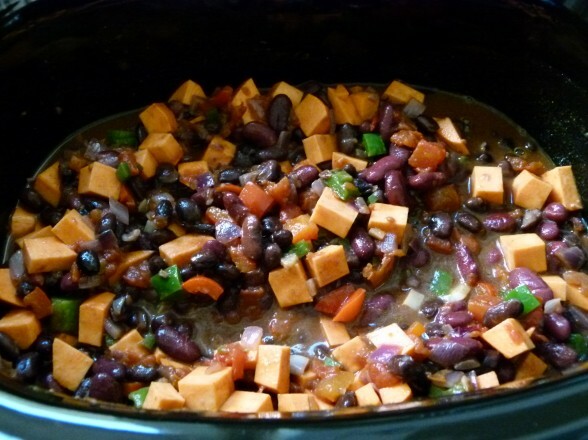 I have made unsoaked dried beans in the slow cooker for 6 1/2 – 7 hours on LOW. Have you tried this in the Instant Pot? I think it would work as is. Thoughts? You and your recipes rock! I haven’t, but I gave someone else some suggestions below. Let me know if you try it! How would you adapt this for an electric pressure cooker? Thinking I could saute the veggies in the multicooker (I have a Fagor) then use the slow cooker function, but interested in trying out the pressure as well. I am going to guess here, but I would do what you said by sautéing the veggies in the machine first. Then I would cook the chili on high pressure for 8 minutes. I just don’t know if you should do a quick release or wait a couple minutes and then release. Have you made any similar recipes in your Fagor before? I have not tried recipes with pre cooked or canned beans in the Fagor yet (only dry beans). I was usure if the canned beans would stay intact and also fully cook the sweet potatoes with my adapation. With our recent addition of child #3, adapting meals to the multicooker has been so helpful during these sleep deprived days 🙂 Thank you so much for your suggestions! Yes, that’s why I suggested such a quick cooking time. CONGRATS on #3!!!!! Hi Pamela! Id love to make this tomorrow for Superbowl! Can i make in the slow cooker today and reheat tomorrow? Or is it better day of? So sorry I didn’t see this until now. Chili reheats great! You can also make it early in the day and keep it on the warm setting on your slow cooker. I am thinking of making this for a super bowl party. Have you ever added chicken or ground turkey to this recipe? If not what do you think/recommend? Since it will be first time making it I wasn’t sure about messing with the the recipe. I also thought about adding corn….. Thanks so much! So would you still use the crock pot with the browned turkey for same length of time or make the stove top version? Yes, crock pot with turkey for same length of time. You can make the stovetop version, but it’s so much easier in the crock pot! this is so terrific. i added a chipotle pepper in adobo sauce to mine & also topped this with the “cashew moment” from Gwyneth’s “Its All Good” cookbook. absolutely delicious and so full of flavor. I am totally obsessed with chipotle peppers!!! I’m sure your additions made this chili absolutely delicious!! I made this tonight and it is AMAZING! John said that he could it all day every day! Thank you, Pamela! How adorable is she? Great to hear your family enjoyed this, Cathy! Just made this (stovetop), LOVE it!! My husband couldn’t stop eating it!! Thank you for your amazingly healthful and delicious and easy to follow recipes!!! You’re welcome, Lillian. I’m happy it was a success for you! I am also addicted to my slow cooker!!! With more snow expected this weekend, this sounds perfect!! Although I am neither a chili fanatic nor a slow cooker convert, your recipe sounded so interesting. I made it the old-fashioned way – stovetop – and it was FABULOUS! Loved the combination of ingredients and spices. Many thanks for broadening my culinary horizons! Just finished our chili dinner. Made the stovetop version and it was fantastic! Added some cooked chopped chicken we had leftover. It was a hit! So glad I discovered your website…have tried a few of your recipes and all have been great! Thank you!! Totally making this for the Superbowl tomorrow! 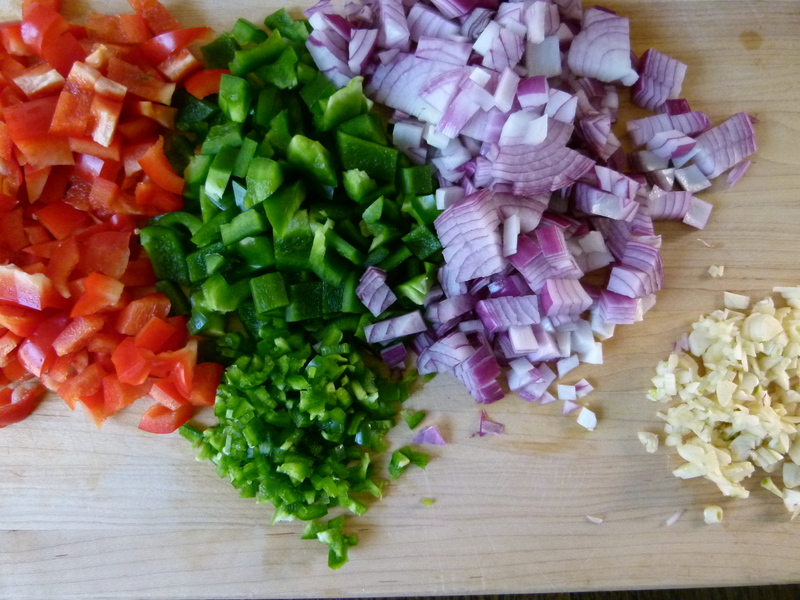 I am just curious, did you use a half or one whole red onion for the chili? I used 1 whole red onion, chopped. So sorry for the typo, thanks for catching that!